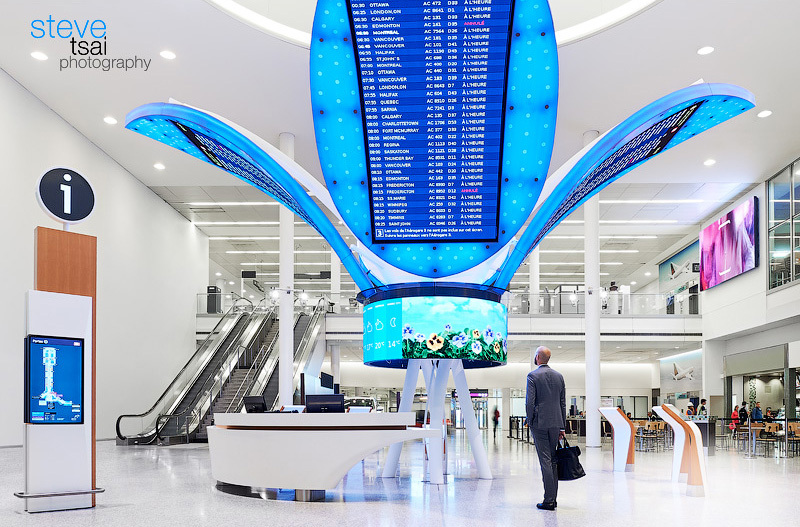 If you have travelled from Terminal 1 at Pearson International Airport, no doubt you have been greeted by the friendly and organic passenger information zone desks, kiosks, and the giant flower sculpture. Surrounding the functionality of screens with information and staff to help passengers, the design and materiality of the kiosks bring warmth and hint of comfort to the travelers where it helps reduce the stress of traveling indeed! On the technical side, the back-lit solid surface flower petals and curved LCD screens are pretty impressive. Along with the flower is the circular information desk, it has a curved steel frame to support 2 large cantilevered ends with a double curved sold surface skin. This shows off Eventscape's outstanding capability to engineer and build designs that can achieve the designers vision! Take a close look next time when you are at Pearson!